We often meet a lot of clients at a critical turning pointing in their growth phase. Business owners who have met that ellusive million dollar mark in annual revenue (though some times they arrive at our virtual door a bit later) and suddenly feel the burden of managing their own bookkeeping catching up to them. It doesn’t take long for a new business owner to understand that accurate and up-to-date financial records play an important part in the success of a business. At the same time, the daily tasks required to maintain these records often fall to the bottom of an owner’s to-do list of priorities. After all, business owners didn't go into business to become bookkeepers--and the value of time spent on maintaining the books translates into a pretty expensive hourly rate! Privacy. There are few things more guarded in a business than internal financial records. This is information that an owner wants kept private and secure. Finding someone you can trust to do the job well, stay with the company long term, and maintain confidentiality is not a simple task--especially when a local bookkeeper knows your personal financial health. Outsourcing to a virtual bookkeeping service with strong client references can give an owner peace of mind by removing the opportunity to have a member of their community in contact with their financial records. Scalability. Growing businesses often start out with smaller needs but rapidly grow to require a full suite of bookkeeping services. 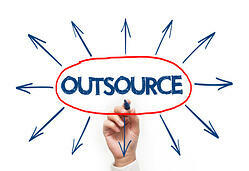 Hiring an outsourced bookkeeping service with controller oversight and a full service offering enables the service to scale to needs, without having to hire or train additional staff. Training and Management. Most business owners are not in the position to be able to train or manage bookkeeping staff--primarily because their bookkeeper likely knows more about it than they do. But the benefits of having a bookkeeper up-to-date on the latest QuickBooks features or have comprehensive knowledge of state tax rules or reporting methods makes a big difference in the quality of bookkeeping. Tax and Audit Ready Financials. Using outsourced professional bookkeeping services to prepare financial records makes accountants, the IRS and banking institutions happy. There is no concern over whether the books are accurate or questioning the integrity of the financial data. Whether a business owner needs to provide financial statements to the bank, satisfy investor reviews or share information with the IRS, outsourced bookkeeping services help make sure there is no doubt about the data. Whether a business needs current financial figures to present to a banker or it just needs to keep tabs on cash flow, keeping up to date on accounting tasks is essential; An easy solution is to outsource bookkeeping to a professional service. Interested in finding out more about how you can outsource your bookkeeping? Contact us for more information!